In reviewing the literatures, one finds a divergence of opinion concerning the anatomic configuration of the pulp cavity and the incidence of two root canals of the mandibular incisors especially they are difficult to access and the second canal usually appears to hide under the cingulam. Different studies [Table 1], ,,,,,,,,,,,, have looked at the root canal morphology of mandibular incisors over the years and pointed out that the root canal types may vary according to race. No data are available on the root canal morphology of mandibular incisors in Saudi Arabian population. Therefore, the purpose of this study is to provide clinical data on the presence of the second canal in extracted mandibular incisor teeth of Saudi Arabian Samples. Type I: A single canal present from the pulp chamber to the apex. 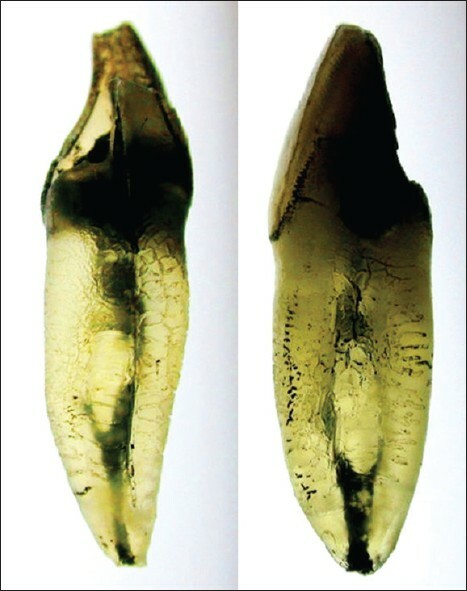 The transparent specimens were examined using X3 illuminated magnifying glass, and the number and type of root canals were recorded. The data was summarized in [Table 2]. 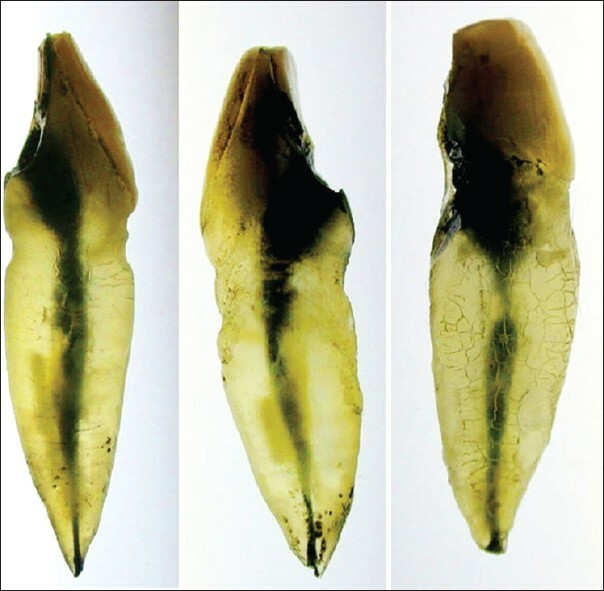 The canal configurations of mandibular central and lateral incisors that were found in this study were type I and type III according to Vertucci's classification. Of the total sample of 80 teeth, seventy percent of mandibular central and lateral incisors (28 centrals and 28 laterals) were classified as type I (one single canal is present from the pulp chamber to the apex) [Figure 1] and [Figure 2]. Thirty percent of mandibular central and lateral incisors (12 centrals and 12 laterals) were classified as type III, (one canal leaves the pulp chamber, then it divides into two within the body of the root, then the canals merges again to exit as one canal) [Figure 3] and [Figure 4]. None of the forty teeth specimens were furcated root teeth; i.e. all had one root. Moreover, all the examined specimens had only one main apical foramen. Studies of the internal and external anatomy of teeth have shown that anatomical variations can occur in all groups of teeth with variable prevalence in different ethnic populations. Thus, a thorough understanding of the complexity of the root canal system is essential for understanding the principles and problems of shaping and cleaning, for determining the apical limits and dimensions of canal preparations, and for performing successful microendodontic procedures. Careful evaluation of two or more periapical radiographs is mandatory. These angled radiographs provide much needed information about root canal morphology. Nattress et al. radiographed 790 extracted mandibular incisors and premolars in order to assess the incidence of canal bifurcation in a root. Using the 'fast break' guideline that the disappearance or narrowing of a canal infers that it divides resulted in failure to diagnose one-third of these divisions from a single radiographic view. The evaluation of the root canal system is most accurate when the dentist uses the information from multiple radiographic views together with a thorough clinical exploration of the interior and exterior of the tooth. A variety of techniques have been proposed to permit visualization of the root canal system and the effect of biomechanical procedures on its morphology. Sectioning of the roots at right angles to the long axis is of value in determining canal contour and size. , But this technique does not permit a continuous view of the canal system. Longitudinal sectioning of the root compensates for the previous limitation by providing an intact canal surface. However, only a limited amount of the canal wall can be retained, and only the more gross morphological details can be observed. Improved examination of the morphology of the canal wall is possible with the use of the scanning electron microscope which permits magnifications in excess of 2,500 and allows for a greatly detailed study of the effect of biomechanical and irrigation procedures. , Again, the major disadvantage is the limited area available for study. 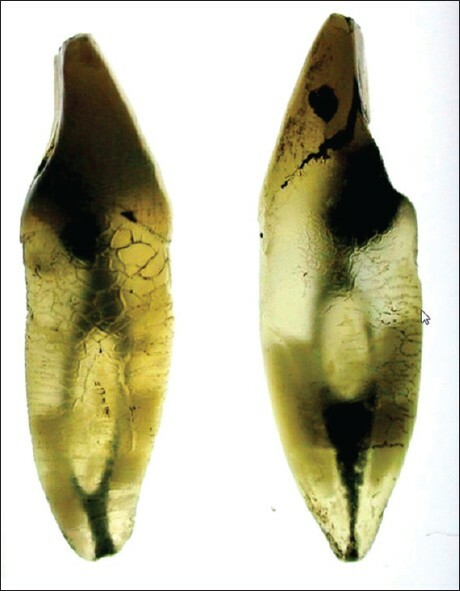 Although various techniques have been used in studies evaluating canal morphology, it has been reported that the most detailed information can be obtained ex vivo by demineralization and staining. ,,, the clearing technique has considerable values in the study of root canal anatomy because it gives three-dimensional view of the pulp cavity in relation to the exterior of the tooth. In addition, the technique is simple and fast (approximately five days are required to complete the entire process). Little equipment and space are required. For this particular technique, inexpensive and less toxic chemicals were used. The clearing technique of the teeth has many other applications rather than the study of root canal anatomy. It was used to assess the canal instrumentation technique, post design, microleakage and the quality of the filling. Moreover, it was introduced as a teaching tool in preclinical endodontics to show the student the root canal morphology and the instrumentation procedures. 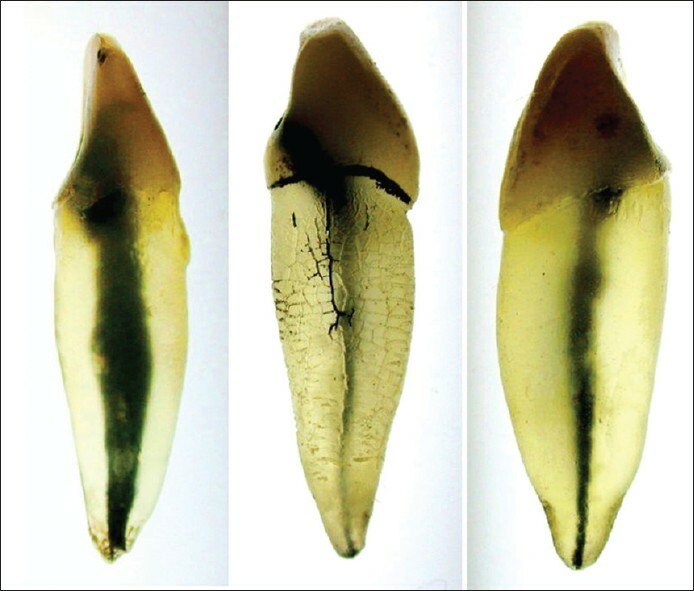 A variety of techniques to demineralized and clarify intact teeth have been reported. Many demineralizing agents have been proposed for example 5-11% nitric acid (the most commonly used agent), 20% formic acid, or 5% hydrochloric acid. The use of weak acid will avoid or reduce the shrinkage of organic tooth tissues. In the same time, many clearing agents have been proposed also (for example methyl salicylate, xylene, benzene, or eugenol) and all of those agents have the ability of making the teeth transparent. The incidence of two canals in mandibular anterior teeth has been reported by several authors to vary between 12.4% to 53% respectively. ,,,,,,,,,,,, Our results (30%) fall in almost the middle of this range. In addition, we found that there is no difference between the mandibular centrals and laterals in the incidence of two canals, which may be attributed to the sample size and the racial differences. Other factors that can contribute to differences observed in the various anatomical studies have been reported by Cleghorn et al. It is humbling to be aware of the complexity of the spaces we are expected to access, shape, clean and fill. We can take comfort in knowing that even under the most difficult circumstances our current methods of root canal therapy result in an exceptionally high rate of success. The incidence of two canals in Saudis mandibular incisor teeth is about one third with no difference between the central and lateral incisors. A thorough knowledge of tooth morphology, careful interpretation of angled radiographs, proper access preparation, a detailed exploration of the interior of the tooth, and magnification and illumination are essential prerequisites for a successful treatment outcome. 1. Pineda F, Kuttler Y. Mesiodistal and buccolingual roentgenographic investigation of 7275 root canals. Oral Surg Oral Med Oral Pathol 1972;33:101-10. 2. Vertucci FJ. Root canal anatomy of the human permanent teeth. Oral Surg Oral Med Oral Pathol 1984;58:589-99. 3. Kasahara E, Yasuda E, Yamamoto A, Anzai M. Root canal system of the maxillary central incisor. J Endod 1990;16:158-61. 4. Ingle J, Bakland L. Endodontics. 5 th ed. Hamilton: BC Decker; 2002. 5. Fischer G. Uber die feinere anatomie der Wurzelkanale menschlichen Zahne Dtsch. Monatsschr 1907;25:544-52. 6. Hess W, Zu¨rcher E. The anatomy of root canals of the teeth of the permanent and deciduous dentitions. New York: William Wood and Co.; 1925. 7. Barrett MT. Internal Anatomy of the teeth with specific reference to the pulp and its branches. Dent Cosmos 1925;67:581-92. 8. Green D. Morphology of the pulp cavity of the permanent teeth. J Oral Surg 1955;8:743-59. 9. Rankine-Wilson RW, Henry P. The bifurcated root canal in lower anterior teeth. J Am Dent Assoc 1965;70:1162-5. 10. Benjamin KA, Dowson J. Incidence of two root canals in human mandibular incisor teeth. Oral Surg Oral Med Oral Pathol 1974;38:122-6. 11. Vertucci FJ, Williams RG. Furcation canals in the human mandibular first molar. Oral Surg Oral Surg Oral Med Oral Pathol 1974;38:308-14. 12. Kartal N, Yanikoglu FC. Root canal morphology of mandibular incisors. J Endod 1992;18:562-4. 13. Miyashita M, Kasahara E, Yasuda E, Yamamoto A, Sekizawa T. Root canal system of the mandibular incisor. J Endod 1997;23:479-84. 14. Gencoglu N. Incidence of furcated canals in mandibular incisors and efficacy of thermafil obturator. Saudi Dent J 2000;12:72-6. 15. Al-Quadah AA, Awawdeh LA. Root canal morphology of mandibular incisors in a Jordanian population. Int Endod J 2006;39:873-7. 16. de Oliveira SH, de Moraes LC, Faig-Leite H, Camargo SE, Camargo CH. In vitro incidence of root canal bifurcation in mandibular incisors by radiovisiography. J Appl Oral Sci 2009;17:234-9. 17. Boruah LC, Bhuyan AC. Morphologic characteristics of root canal of mandibular incisors in North-East Indian population: An in vitro study. J Conserv Dent 2011;14:346-50. 18. Vertucci FJ. Root canal morphology and its relationship to endodontic procedures. Endod Top 2005;10:3-29. 19. Nattress BR, Martin DM. Predictability of radiographic diagnosis of variations in root canal anatomy in mandibular incisor and premolar teeth. Int Endod J 1991;24:58-62. 20. Kulild JC, Peters DD. 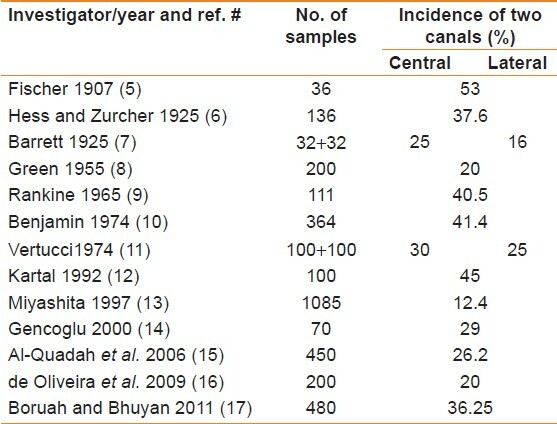 Incidence and configuration of canal systems in the mesiobuccal root of maxillary first and second molars. J Endod 1990;16:311-7. 21. Schwarze T, Baethge C, Stecher T, Geurtsen W. Identification of second canals in the mesiobuccal root of maxillary first and second molars using magnifying loupes or an operating microscope. Aust Endod J 2002;28:57-60. 22. Gilles J, Reader A. An SEM investigation of mesiolingual canal in human maxillary first and second molars. Oral Surg Oral Med Oral Pathol 1990;70:638-43. 23. Robertson D, Leeb J, McKee M, Brewer E. A clearing technique for the study of root canal system. J Endod 1980;6:421-4. 24. Neaverth EJ, Kotler ML, Kaltenbach RF. Clinical investigation (in vivo) of an endodontically treated maxillary first molar. J Endod 1987;13:506-12. 25. Sieraski SM, Taylor GN, Kohn RA. Identification and endodontic management of three-canalled maxillary premolars. J Endod 1989;15:29-32. 26. Neelakantan P, Subbarao C, Subbarao CV. Comparative evaluation of modified canal staining and clearing technique, cone-beam computed tomography, peripheral quantitative computed tomography, spiral computed tomography, and plain and contrast medium-enhanced digital radiography in studying root canal morphology. J Endod 2010;36:1547-51. 27. Cleghorn B, Christie W, Dong C. Root and root canal morphology of the human permanent maxillary first molar: A literature review. J Endod 2006;32:813-21. 28. Stropko JJ. Canal morphology of maxillary molars, clinical observations of canal configurations. J Endod 1990;25:446-50. 29. Go¨rduysus MO, Gorduysus M, Friedman S. Operating microscope improves negotiation of second mesiobuccal canals in maxillary molars. J Endod 2001;27:683-6.